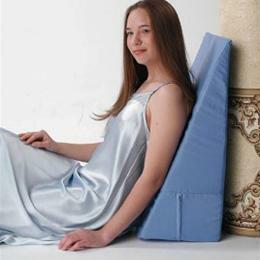 When used together, the Bed Wedge and the Leg Wedge reduce the stress of gravity pulling on the lower back, while supporting the body in a relaxed position. Wedges are used to elevate the head for breathing comport, circulation, pressure relief and for treatment of hiatal hernia. Can also be used to elevate the feet. Made of firm polyurethane foam. Size: 24" x 25" x 10". Color: Sand.